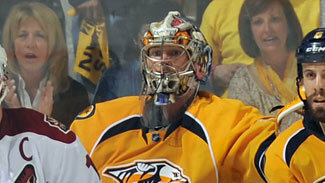 NASHVILLE – Earlier in the day, Pekka Rinne's goaltending coach said the two-time Vezina Trophy finalist did not have a chance to be dominant because of the way his team played in front of him in the first two games of its Western Conference Semifinal series with Phoenix. On Wednesday, the Preds returned to form and Rinne returned to his dominance, posting a 32-save shutout in a 2-0 win over the Coyotes in Game 3 at Bridgestone Arena that cut Nashville's deficit to 2-1 in the series. Rinne entered having allowed nine goals in the first two games of the series -- as many as he had yielded in all five of the Preds' series victory against Detroit in the first round. Yet Mitch Korn, the Preds' goaltending coach, said he felt good about the way Rinne had played despite an .857 save percentage in the first two games against Phoenix. "Yeah, it feels good, obviously," Rinne said. "It's always tough, obviously, when you give up a lot of goals and you lose two games in a row, you put a lot of pressure on yourself and for sure it feels good to win this one. It makes this series totally different now." Even though Nashville jumped out to a two-goal lead in the first period -- their first lead of the series -- the Preds had to fend off some dicey moments at the end. At 12:59 of the third period, Sergei Kostitsyn was whistled for hooking Phoenix's Martin Hanzal along the boards. Then at 14:18, Martin Erat earned a tripping minor for taking down Oliver Ekman-Larsson along the Nashville blue line as the Preds were about to clear the puck from their zone. That set up a 41-second 5-on-3 for the Coyotes. Preds captain Shea Weber cited the old hockey maxim that the goaltender has to be his team's best penalty killer, and that Rinne was in that sequence. "It could've changed on that 5-on-3," Preds coach Barry Trotz said of the series' momentum. "They score two goals and we could be playing for a couple of hours here." The Coyotes had a couple of glorious chances, but did not capitalize. Shane Doan set one up with a long slap shot that Rinne stopped. The puck bounced out to the left side to Radim Vrbata, a 35-goal scorer during the regular season. From close range near the goal line, Vrbata let a snap shot go and with Rinne on his stomach, the 6-foot-5 Finn flipped his long legs up into the air. The goalie wasn't sure if it hit him or not, but the puck went off course. "That hit Hal Gill," Rinne said. "I might've got a piece of it afterwards, and he made a nice block there." Rinne was aggressive during the kill, jumping out of his net to freeze pucks to help short-circuit the Coyotes' momentum. Coyotes coach Dave Tippett counted two wide-open looks for Vrbata on those power plays. "He throws his leg up, laying on his stomach," Tippett said. "Vrbata, that's one that goes in a lot of times for him. Tonight, it didn't go in." In the two days off between Games 2 and 3 – during which the Preds had to suspend two of their top offensive players, Alex Radulov and Andrei Kostitsyn, for a violation of team rules – Trotz talked about how disappointed he was in his team's defensive effort, how the Preds failed to box out and prevent second-chances on rebounds and how they didn't tie up the Coyotes with their sticks. On Wednesday, he said the team's "compete level" was much better. It showed in those areas. Rinne talked earlier in the day about the symbiotic relationship between goalie and team and emphasized it again after the win. But, he also knew he could be better. "When everyone's battling it, it becomes contagious," he said. "Everyone seemed to spark up and do their best."